The holiday season can be a mixed bag of emotions. For some, it is a reminder of a loved one who has passed or a stressful time where they try to get together enough money to purchase gifts. The commercialism of the holidays can cause us to get swept up in the pressure of how things “should” be. What I love about the holidays is the sentiment behind gift giving. As I’ve gotten older, I’ve refined my vision of what holiday gifts “should” be and have found more meaning through simpler, more heartfelt offerings. And I’ve taken pressure off myself to be joyful at all times. I lost my mother many years ago during the holiday season, so I am often reminded of her absence and exit from this world around this time. I’ve found that by altering my attitude towards gifts and allowing myself to honor my feelings has made the holiday season much more doable. And I have definitely enjoyed some wonderful times with family and friends during this time of year and am really feeling a flow of love and generosity this year. I think the holidays are much like the rest of life. When you tune out the “shoulds” and listen to your heart, you can feel a certain peace of mind. I really don’t feel that gifts are a requirement for the holiday season, but I admit, I enjoy them. Especially when they are meaningful and genuinely offered. The exchange of gifts is a nice tradition that can help express our gratitude for others in a tangible way. If you are in search of a personalized gift for family or friends, please consider giving them a gift certificate for an astrology reading from me. This is a gift that will be delivered with love, compassion and some valuable insights. I offer gift certificates for individual or couples’ readings that never expire. Just email me at cardinalfireastrology@gmail.com for more info. Many people like to display their birth chart prominently after having a reading. It can be a great reference tool and it’s worthy of becoming a work of art. That’s exactly what my friend Stephanie Wilder has done with her Astro Art Charts. You can choose from a variety of stunning backgrounds for your astrology chart. 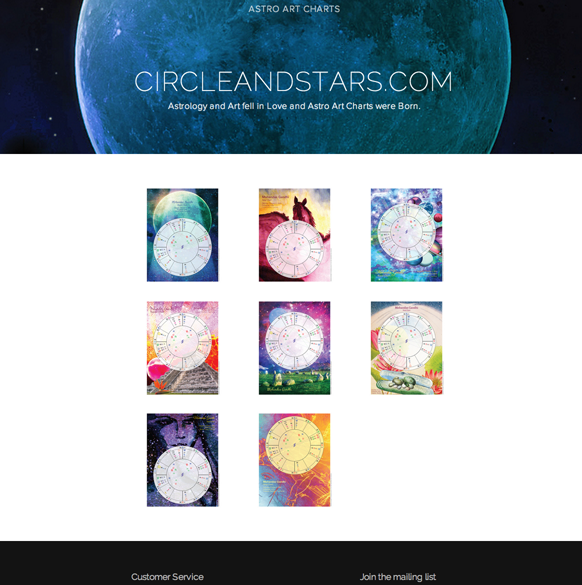 Visit circleandstars.com to see her selections and order an Astro Art Chart as a nice accompaniment to a personalized reading from me. I mention the Winter Solstice (Dec. 21) in the title of this blog because for astrologers, the Solstice is very much a part of the holiday season. It represents a turning point in both nature and our lives. In the Northern Hemisphere, although it is known as the “darkest day of the year” we also know that all the days going forward until the Summer Solstice will be increasingly lighter. Astrologically it’s a time to take stock of the previous year and see how we can lighten our load going into the next season. It’s an excellent time to spend some quiet time listening to your heart and re-dreaming your life. Although there are a lot of parties this time of year, I am often very selective about which ones I attend. Here in the Northern Hemisphere it is much more in synch with the natural rhythms of our planet to slow down this time of year. Once I started letting go of the idea that I “should” (here come the “shoulds” again) be socializing like crazy every December, I felt more at peace with myself and the season. This Solstice, I hope that you can give yourself the gift of some peaceful contemplative time and relief from the pressure to spend a lot of money buying presents. This Solstice, consider letting go of some of the “shoulds” in your life. Happy Solstice and Holiday Season to you all! 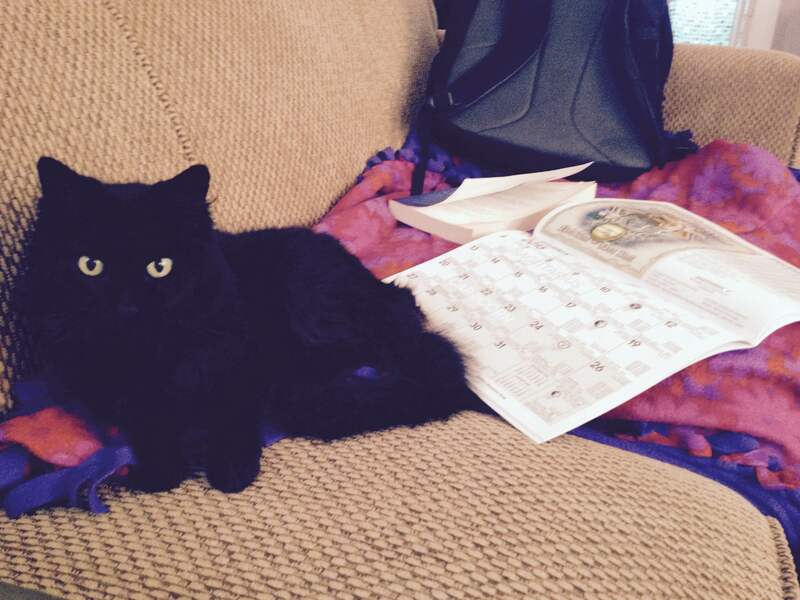 My Astro Assistant and Muse, Lily. Your December Horoscopes are online here. As we enter the last month of 2014 together, I wanted to express my gratitude for the people in my life and even those I don’t know who read this blog and support the work that I do. When I look back over the year, I can see how I have learned so much more about this vast science/art/philosophy called astrology. I’d like to specifically name a few people. First, I owe everything I know to my mentor and teacher, Emily Trinkaus. She not only got me excited about astrology, but also I believe she teaches a unique and powerful way of interpreting the planets and our relationship to them. If you have not read her 2015 predictions article in this month’s Mountain Astrologer, I urge you to check it out ASAP. Great stuff! Emily is also offering a DIY Teleclass called “Forecast Your New Year – DIY Astrology of 2015.” Check it out here. I also am proud to be celebrating 2 years of working for the fabulous Jan Spiller. Thanks to Emily’s recommendation, I have had the honor of being on the Jan Spiller Support Team, where I write monthly horoscopes (the ones you see here), among other things. Jan, a world-renowned astrologer and the author of many books, including Astrology for the Soul, New Moon Astrology, Cosmic Love, The Astrology of Success and others, is dedicated to offering humanity empowering astrological information. I have learned so much these past few years and am excited about how much more I can expand my knowledge and skills under her direction and mentorship. Be sure and check out her newly designed website, launching this month here! I’m also extremely grateful for everyone who has gotten a personal reading from me this year and/or recommended me to a friend. This type of word of mouth is the best marketing I could ever ask for. I’d say I’ve doubled or even tripled the amount of personal readings I’ve done this year compared to last year. Thank you! I always have a bittersweet feeling at the end of the year. I’m nostalgic for the good times and sometimes it’s hard for me to move forward (I know, I’m an Aries!). But I have a lot of Earth in my chart that tends to make me hold on to the familiar and the sentimental. However, there’s a lot I’ll be ready to release. 2014 wasn’t an easy year for many of us. If Saturn in Scorpio didn’t get ya during 2013, it probably came knocking this year, reminding you of your deepest fears and losses. Well, the good news is that Saturn is heading into Sagittarius December 23 and we should all feel a bit of a lift in our spirits. I could go on to mention the potential challenges of the Uranus-Pluto Square, which will be exact on December 14, but you can read that in your monthly horoscope. Instead, I choose to focus on everything I am grateful for and I am making some new commitments to myself. I’m ready to raise the standards for myself and engage in daily practices that expand my skills in astrology (and music!). Thanks, everyone, for the support, motivation and inspiration. I say we finish this year in solidarity as we pledge to move into 2015 ready to be stronger, wiser and kinder.